What is another word for isolation? State of being isolated or alone. 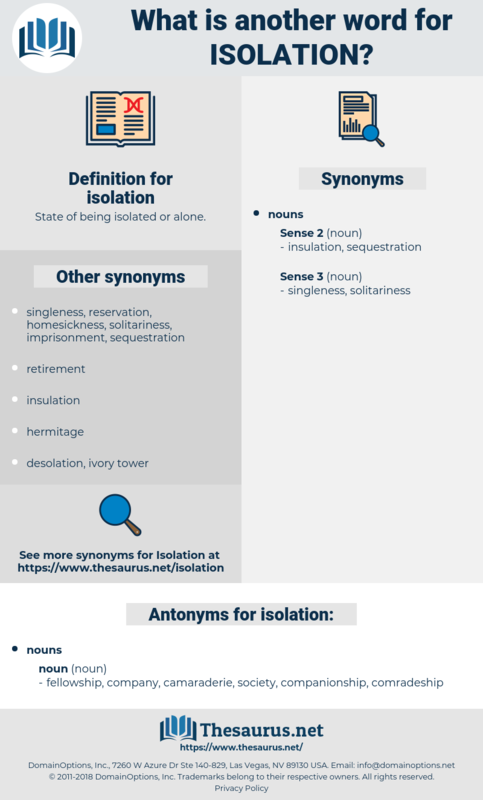 isolationism, self-isolation, alienation, insulation, solitude. GIS, compartmentalisation, marginalization, Isolator, disintegration, compartmentalization, independently, isolates, detention, defenceless, solitaire, ousting, impeachment, vacuum, regardless, separate, blockade, expulsion, baffle, irrespective, estrangement, removal. seclusion, exclusion, isolating, loneliness, segregation, insularity, marginalisation, sequestration, ostracism. fellowship, company, camaraderie, society, companionship, comradeship. One result, nevertheless, of this isolation was to throw the young colonel back upon his own resources. The county families had not called, but he was not yet aware of his social isolation. quarantine, alienation, detachment, anomie, estrangement, insulation, secrecy, insularity, solitude, loneliness, purdah, privateness, insularism, Anomy, solitariness, concealment, privacy. defense mechanism, Defence Reaction, defence, defense reaction, Defence Mechanism, defense.